That’s Mao; nobody listens to him. But that’s probably because he’s a figment of Charlie’s imagination. An unwitting Charlie—rudely interrupted in the middle of typing out his umpteenth suicide note—is hurled into a brave new world of addiction, rock music, and debauchery in this tale of growing up and going down. From rolling joints to rolling in drug money, from backing out of life to fronting somebody else’s rock band, he’s in for a bumpy ride. Charlie divides his time between being in love with Paloma and hating himself, between living out Nineties music video fantasies and wishing he were someone else. The problem is it’s 2006 and MTV is not Music Television anymore. Mixtapes are passé, self-loathing is cliché, and Charlie’s world is fast deteriorating into caricature. At the end, Charlie is forced to figure out which one of his many lives he really wants for himself. Question: you can take a boy out of the Nineties, but can you take the Nineties out of him? Tharun James Jimani is a blogger and writer based in Bombay. His short story 'An Absurd Romance' was published in the anthology, 'Music of the Stars and Other Love Stories', from Scholastic. 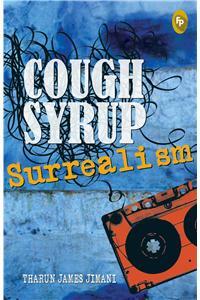 'Cough Syrup Surrealism' is his first novel. Publisher: Prakash Books India Pvt. Ltd.